Length 5.8 km (3.6 miles), terrain is hilly, rising 160 meters, elevation is high: 2800 meters (9000 feet)! Warning: Don't try this on your first couple of days if you've just arrived from some location near sea level. Take it easy the first few days! Snowmass is developing into an all-year resort. So if you find yourself there in the summer, here's a great spot to run, especially nice as a morning run in the cool morning air. If you like trail running, this will feel like heaven. 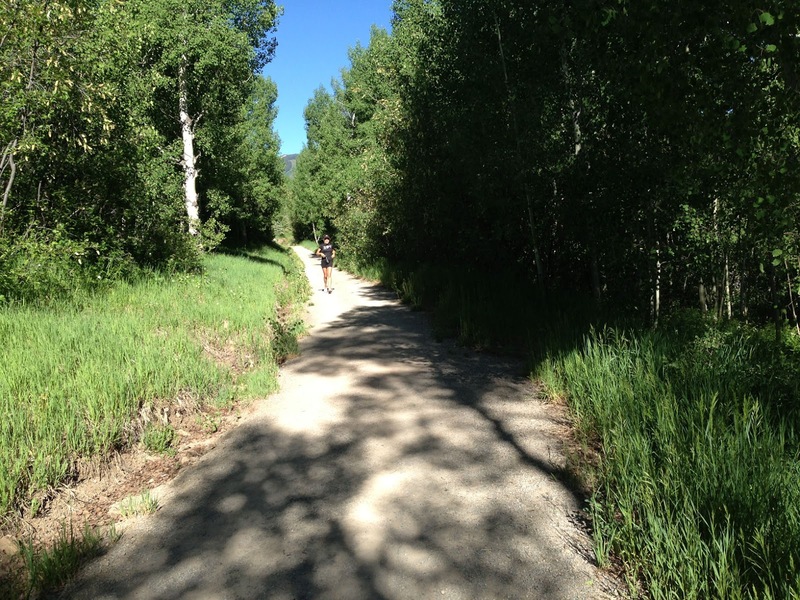 This fairly short route gets away from all the buildings, people and activity of Snowmass Village, and leads you out into pure nature, with wide vistas and backcountry beyond Snowmass Mountain, with views of Snowmass Creek Valley and Mt. Daly. 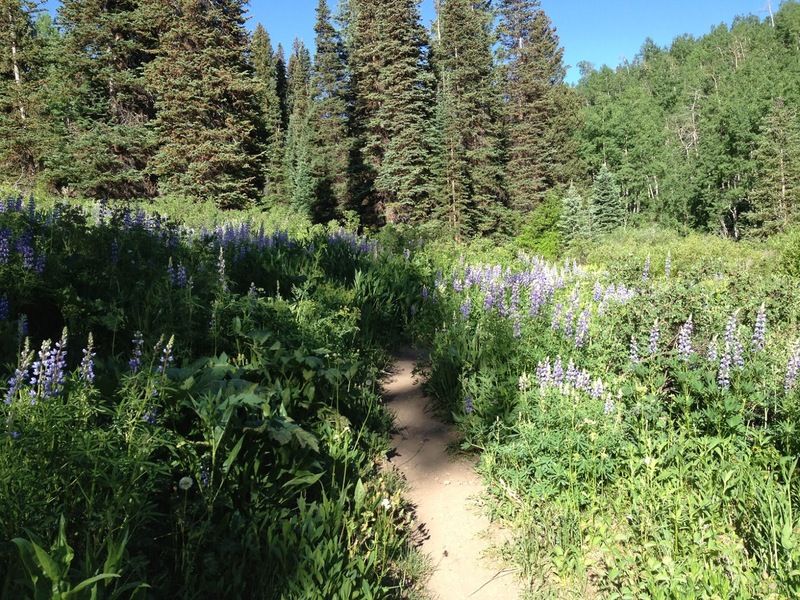 This out-and-back run combines three trails: the Nature Trail, the Sleigh Ride Trail, and the Ditch Trail. So, if you're psyched to go, then let's head out! 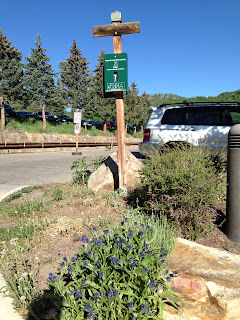 Start at the Snowmass Mall. Go up to the top level, and go out to the street. You'll see parking lots across the street, and a wooden sign pointing straight ahead, to the far side of the parking lot. Just follow that arrow to the back of the parking lot to start the run! Just follow that arrow and run across the parking lot, then down the wooden steps. You're now on the Nature Trail, heading westwards. The Nature Trail lives up to its name: this narrow trail winds through a changing scene of woods and meadows, following Brush Creek, going uphill. 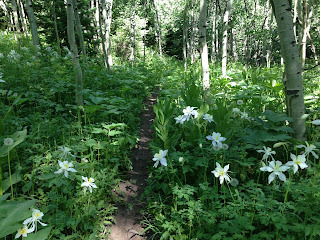 There are pine woods and aspens, and lots of wildflowers. 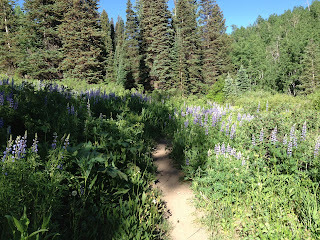 I ran it in June, and there were hundreds of purple lupine, and strangely large yellow flowers. NOTE: There are a lot of tree roots and big stones along this part of the run, with a lot of ankle-spraining potential, so watch where you're running! Don't expect the first kilometer to be fast. It also has a few short but steep climbs, rising 100 meters in the first kilometer. If you aren't used to the altitude, take it easy. 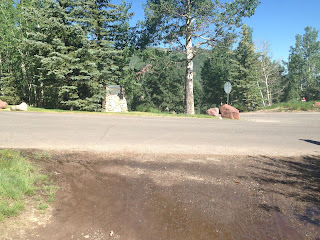 I, as a flatlander, struggled with the climbs, and I walked the steepest ones. 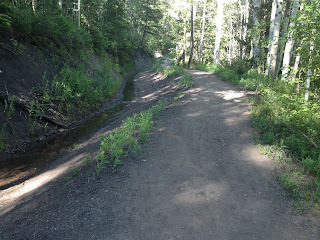 One side-creek makes the trail so muddy in one spot that you have to find a detour up along higher ground. At 1.3km, the Nature Trail goes up a short uphill stretch and then runs into the Sleigh Ride Trail, a smooth, graded trail that feels more like a sidewalk. Turn right and continue westwards. In 100 meters, the Sleigh Ride Trail ends where a street crosses it. Several streets branch off at this spot. Continue straight by running past the right side of the stone sign ahead of you. You'll see a wooden sign for the Ditch Trail, which starts behind the stone, and is very narrow at this point. Run straight to those rocks at the corner to begin the Ditch Trail! The trail soon widens into a hiking trail with no more gain in elevation. As its name points out, this trail follows a ditch with flowing water. NOTE: It may not look like an Audi Q7, but you're looking at some German technology in that ditch. Back when this was a mining area, the biggest problem for miners was the groundwater that seeped into their mines. And the only way they could pump it out was with a water-mill. So they used the nearest creek to power a water mill. 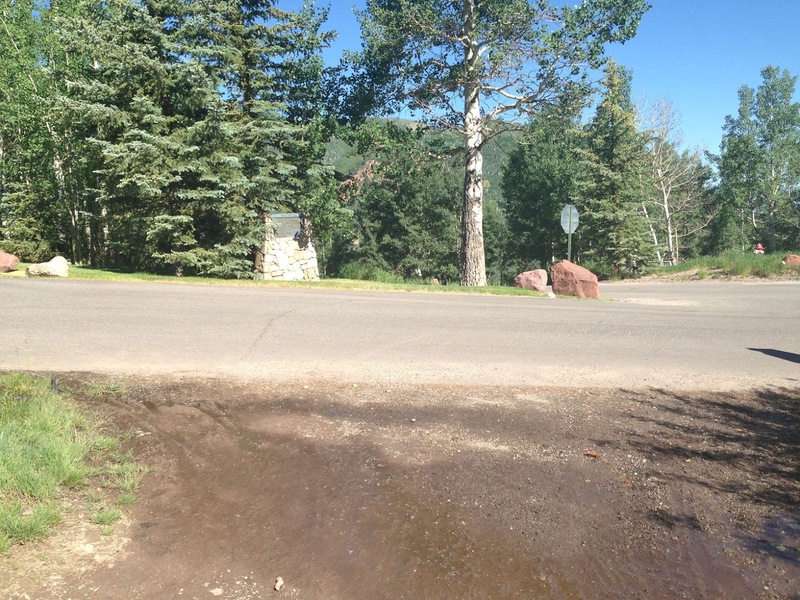 But often just one creek wasn't enough to provide enough power to pump out all the water. So they built such ditches along the mountainsides to catch other creeks and to divert them to the mine and its mill. This technique was perfected by German miners in medieval times, and was put to use in the Wild West. 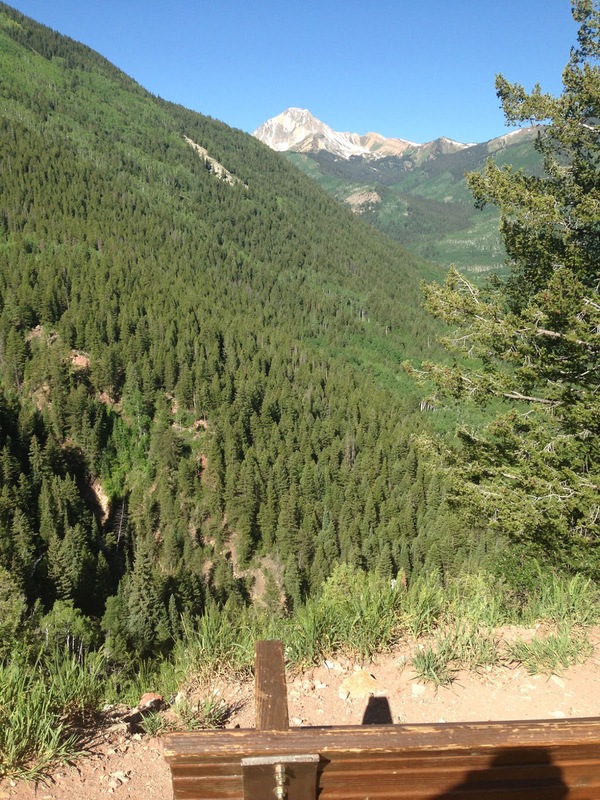 The Ditch Trail is the place where you'll get one great view after another. 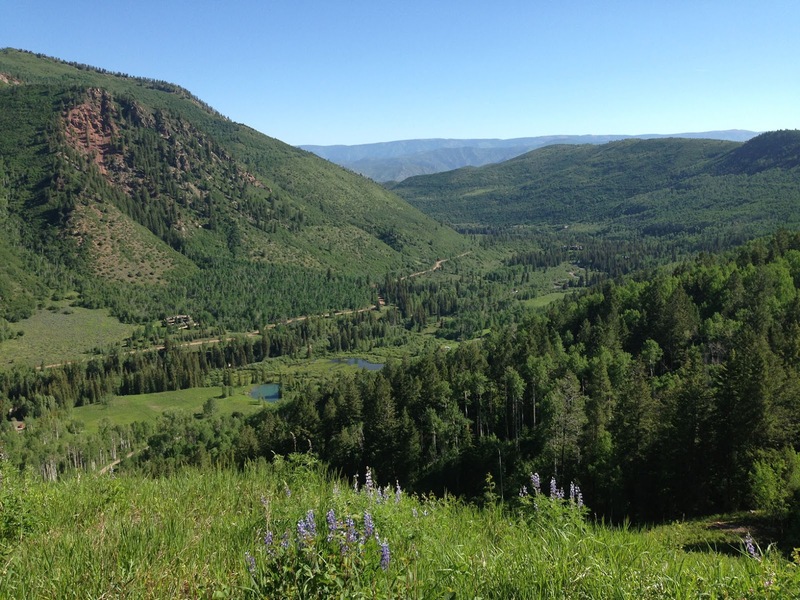 Looking off to your right, you'll see Snowmass Creek Valley with its little ponds. And straight ahead, you'll see snow-capped Mt. Daly and other big peaks. You will run under the Campground ski lift after 2.4 km, then soon, in another half-kilometer, come to a spot where trail makes a sharp turn to the left and begins to go uphill. There is a waterfall in the valley ahead, which you can hear. And there is a bench to sit and enjoy the view south towards Mt. Daly. This is our turn-around point. Now run back the way that you came. The best thing to do then is to jump into the hotel pool. But you'll have a hard time trying to keep a big, silly grin off your face as you lie there in the Colorado sun. 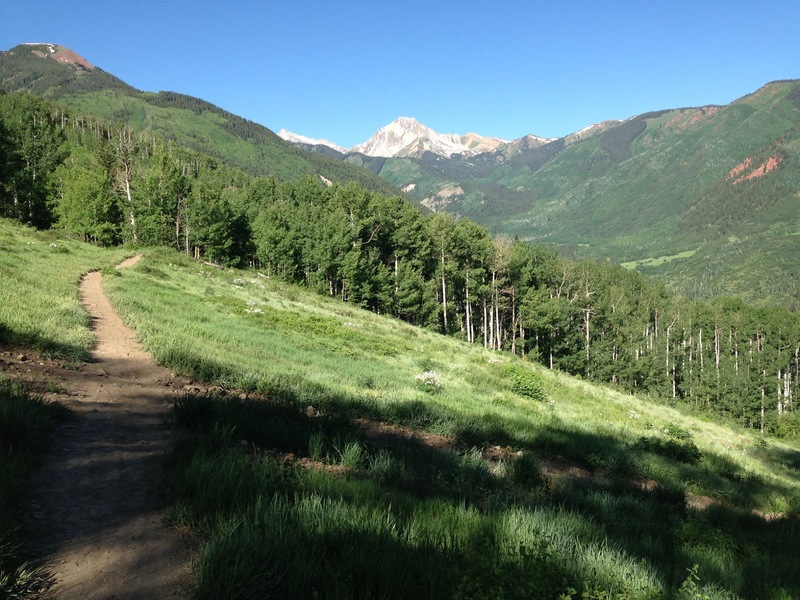 I'm going to Snowmass next week for a conference and was looking up running trails to run on during my 3-4h daily break that we get. I enjoyed this post! I've never been to Colorado before and will be in for a treat! Thank you.